human disease: from choosing the right molecular design, to pre-clinical characterization of the purified product, through to batch optimization and quality control for large-scale cGMP production. The whole of the second part is devoted to case studies of Fc-fusion proteins that are now commercially successful products. In this section, the authors, several of whom were personally involved in clinical development of the products themselves, detail the product?s background and give insight into issues that were faced and how these issues were overcome during clinical development. This section also includes a chapter on promising new developments for the future. 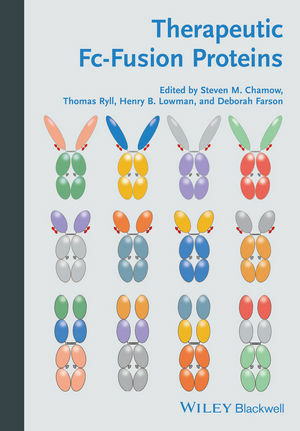 An invaluable resource for professionals already working on Fc-fusion proteins and an excellent and thorough introduction for physicians, researchers, and students entering the field. consulting firm. He has developed protein therapeutics for 26 years and contributed to the development of three marketed products (Avastin, Natrecor, Vectibix). He began his career in process development at Genentech, Inc. and has served in management and executive roles at several other biotechnology companies. He is author or co-author of more than 45 scientific publications and patents and co-editor of a 1999 book entitled Antibody Fusion Proteins. Educated at the University of California and trained at the National Institutes of Health, he lives in San Mateo, CA with his wife. Thomas Ryll, PhD currently serves as Senior Director of Cell Culture Development at Biogen Idec in Cambridge, MA. He has contributed to the development of several marketed products, including Rituxan, Raptiva, Vectibix, Eloctate and Alprolix. He began his career at Genentech, Inc. as scientist in process development. Since then, he served in various scientific and management roles with increasing responsibilities at Abgenix, Inc., Tanox Inc., and Biogen Idec, Inc. Educated at the Technical University of Braunschweig in Germany, he is author or co-author of more than 35 scientific publications and patents. He lives in Lexington, MA with his family. Henry B. Lowman, PhD currently serves as Chief Scientific Officer at CytomX Therapeutics, Inc. Dr. Lowman served a 20-year tenure at Genentech, Inc., where he focused on protein and antibody therapeutics. His career interests include structure-based protein design, structure-function analysis, and molecular diversity techniques. Dr. Lowman is an author on more than 60 scientific publications, inventor on more than 60 issued patents, and an editorial board member for the antibody journal mAbs. Dr. Lowman earned his B.A. in chemistry at Johns Hopkins University and PhD in chemistry at Purdue University. worked as a cell biologist at Cell Genesys, Inc. for 19 years. As a Senior Director of Research and Development, Deborah Farson was responsible for the development and characterization of cell lines for use as immunotherapy products. In addition, her department developed cell lines for use in assay development and for production of recombinant proteins and antibodies. She is an author or co-author on 16 peer-reviewed journal articles and 4 issued patents. Deborah Farson currently resides in Santa Fe, NM.